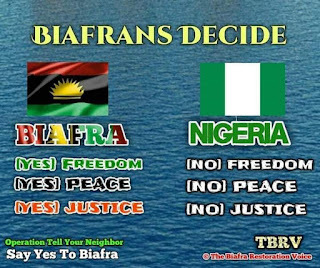 16th of February has been mapped out for Biafra Referendum by IPOB leadership. This statement was officially declared by IPOB leadership on 28th of February, 2019. Recall that it is on this same date that the Nigeria Presidential election is scheduled to take place. Regarding this, many questions have been raised by some people out there as to how possible it will be for IPOB to successfully conduct her referendum while the Nigeria Presidential election is ongoing. To understand the reason for IPOB unorthodox act over this, one should first look at the major cause why IPOB is calling for an Election Boycott in Biafra Land - It is for the FG to grant her a date for a referendum. Also recall that Mazi Nnamdi Kanu, the leader of the Indigenous People of Biafra in his last Broadcast on 19th of January, 2019 categorically explained the purpose for the election Boycott to the general public on Radio Biafra London. According to Mazi Kanu, "Biafrans must Boycott all Nigeria elections till FG grants IPOB a date for a referendum..."
"The election Boycott in Biafra land will make the world to know how serious we are in our struggle for Biafra Independence," Mazi Kanu said. Meanwhile, Korie Ezechime, a Biafran had posed this very question earlier today on my Facebook wall, in response to my post on the Referendum date. "Hmmm! How and where are we going to vote in that referendum?" @Korie Ezechime watch, learn and wait for further instructions as regards the issue of Biafra Referendum, my brother. Make sure you are a good student of Radio Biafra London and constantly listen to our leader, Mazi Nnamdi Kanu, then and only then shall you get all the answers you are looking for. In the same regard, Ibeh Emeka Egbogu, another Biafran also wrote on my post. "I think, the call for Election Boycott in Biafra land is another method of giving Muhammadu Buhari (Jubril) votes. So, if you ask me, that idea is completely irrational." @Ibeh Emeka Egbogu, that is just your own opinion but it is not the fact. I think the proper question you should be asking here is, "why is IPOB calling for Election Boycott?" Perhaps I would have been in a better position to explain to you about the need for the election Boycott. Besides, IPOB is demanding for the absolute freedom of her own people and not interested in the Nigeria Janjaweed politics, okay! Same thing also applicable to those of you out there who harbour such thoughts like our brothers above. Please, always listen to Mazi Nnamdi Kanu's Broadcasts on Radio Biafra London so as to get cleared of any confusion you may have been going through. Always remember this, IPOB leadership knows the necessary steps to take in the struggle for Biafra freedom, and should be bestowed maximum confidence in, with eagerness to flow in their well-thought direction per time than reluctance and doubts that birth multiple questions. So, if you are a Biafran, and you are asked to do something by IPOB leadership, please go right ahead and do it. Biafra Restoration is something sacrosanct and the coming of Biafra is the end to our people's sufferings. When Biafra is restored, the black race generally will be free from the White's supremacy. Stop voting "Criminals into power, they will end up looting and pillaging our national treasury. 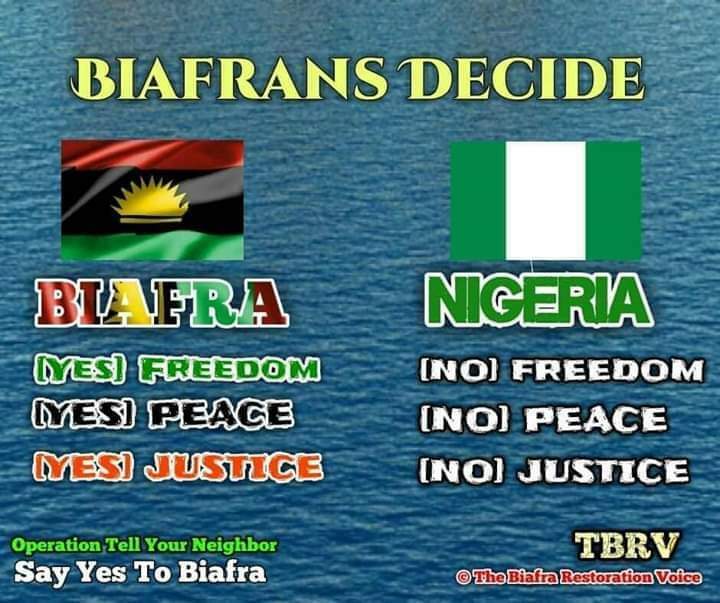 Support Biafra Referendum and boycott the Nigeria elections so that the world may know how serious we are in our struggle for Biafra Independence.